If you have an Advent calendar or would like to have a special Advent calendar, I have a gift idea for you. Each year, LEGO makes an Advent Calendar set. I love the LEGO Advent Calendar--it's boxed with 24 doors to open, one for each day of Advent. Behind each door is a little bag with a miniature Lego set to build for that day. If you have your own Advent calendar, these would be wonderful toys to stuff in each gift box. Of all the things I ever did for my boys for Advent, this is far and away the thing they enjoyed most. As it happens, one of my sons is still a huge fan of LEGO, so we're still buying the Advent Calendar every year! Have you seen it? At my Target, there was a large display at the front of the toy section with these books. There's a coupon for $5.00 off the purchase of the Advent Calendar. It's good through November 24. If you're interested in learning more about the LEGO Advent Calendar before you decide whether to purchase it, you can see a review of it on YouTube. The review was done by my youngest son, also known as LegoLee329. He definitely gives the low-down on this set! Even if you don't want to watch the whole review, it can be helpful to get a glimpse of the product. No one is paying me to tell you about this set--it's just a product I love and I wanted to pass along the news of a good deal. I'm joining Frugal Friday at The Shabby Nest and Weekend Bloggy Reading at Serenity Now, and Monday's Money-Saving Tips at Homebody. Thanks, I am getting this for my grandson. He is a huge Lego fan also. Where did you find the coupon book? If it was in last week's ad -- I didn't see it. Thanks for the idea, Richella. I have two nephews who are huge Lego fans, and this is perfect for them. I have to look for the coupon book the next time I'm there. The advent calender looks so awesome. My boys are grown now but how they loved Legos when they were little! What a great idea! 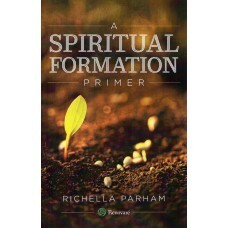 Thanks for sharing, Richella! Hi Richella...Thanks for posting this! My oldest son has been asking for the Lego Advent calendar for the past two years. 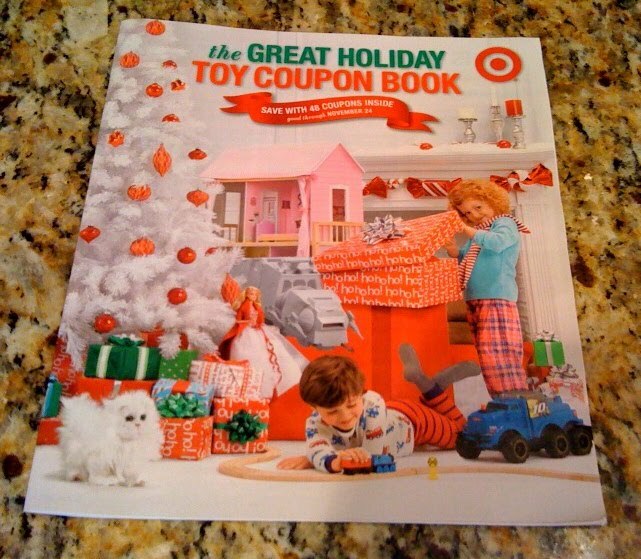 I'm off to see if my Target still has the coupons!! Great deal! I do love my Target. ;) My brother loooooved his Legos. This would have been right up his alley when he was a kid. :) Thanks for linking up with me! 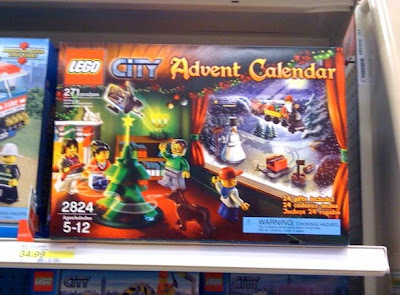 I've never heard of a Lego Advent calendar. If I knew a child who'd enjoy this, I'd be out and about to purchase one today. My 7yo sweetie is a huge lego fan, and I'd love to keep encouraging that. I have never, ever heard of the advent calendar by lego, though! I would love to get this for Jacob!! (Or may need to plant a bug in grama our auntie's ear...) Thanks for sharing! Blessings! We used to do the Lego Advent calendar every year for my daughter. She used to love playing with the animals and characters all year round. Of course she wound up having like 7 santas ater a while but it didn't bother her! This looks perfect for my sons who are turning 6 in a couple of weeks. They really are getting into legos. Oh this is great!!! My little boy would love this fun calendar! 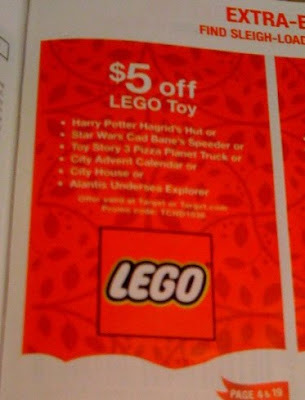 Lego is always a popular gift with my boys...I need to find that coupon book! Thanks for the heads up, and for joining my party! If you can't find the book, you can print the same $5 off coupon from Target.com. On the front page, scroll down to Coupons at the bottom, then go to Toys and search for it. Also--this is a good week to buy it at Target because it's also marked down to $27 from the $34.99 regular price. LOVED the video, your son did a FANTASTIC job, my favorite part is when he opens the packages. I am going out today and getting this for my lego addicts! This was great!! :) I had no idea that LEGO did this every year, but my boys would love it! Thanks so much for the info. And tell your son, great job! !